When galaxies collide, what happens to dark vs. light matter? I have read that galactic collisions have been used as evidence demonstrating the effects of dark matter. In particular, that luminous matter slows down and interacts while dark matter shoots through, essentially unopposed. If a typical galaxy consists of a particular ratio of dark and light matter (or range of ratios, I guess), would a collision remnant contain less, or even zero, dark matter? 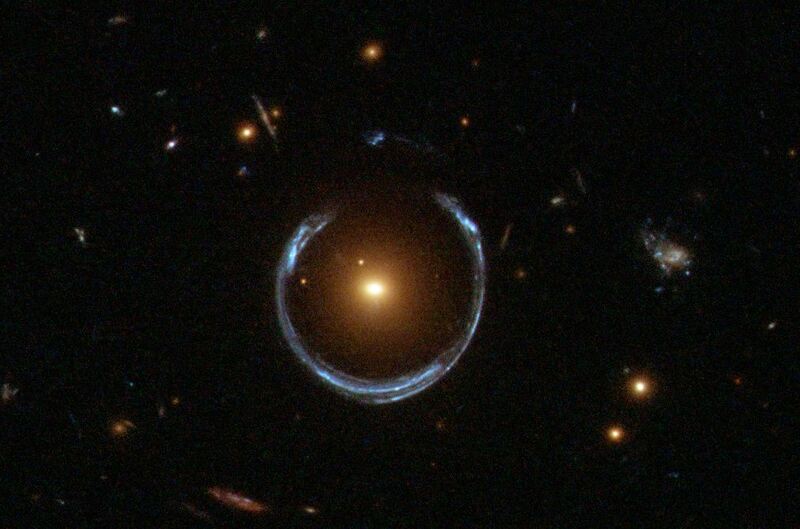 Do we see regions of gravitational lensing with a lower-than-expected luminous matter component that could be remnants from significant collisions? This is exactly what occurred in the collision in a galaxy cluster known as the Bullet Cluster. The name comes from the red shock wave to the right of the picture, indicating a collision in the past. In this picture, created in 2003, two galaxy clusters have collided and passed through each other. The red coloring indicates where X-rays from high-temperature hydrogen gas were detected by the Chandra X-ray Observatory. Most of the normal (baryonic) matter in a galaxy cluster is in this hydrogen gas, not the stars, black holes, and other visible objects. So, the red is where most of the normal matter is located. The hot gases from the two galaxies interacted electromagnetically and clumped together in the middle of the collision point. Electromagnetic interactions often result in photons being released, carrying away energy and allowing the normal matter to clump together (not too dissimilar from photons emitted when electrons bond to nuclei). The blue indicates where most of all the mass is, as inferred from weak gravitational lensing--that is, the distortion of images of galaxies (taken by the Hubble Telescope) from behind this cluster due to the gravity of these galaxies. The lensing is weak in this picture, so it's difficult to see, but a more obvious example can be seen in the following picture of a galaxy. The central reddish-yellow galaxy is distorting the image of the blue galaxy directly behind it. So, going back to the first picture, the majority of the mass that gravitates (the blue) can be separated from the mass that interacts with light (the red). The conclusion to draw is that most of the matter in a galaxy is made up of something that does not give off light (hence, dark) but still gravitates. Dark matter only seems to interact with anything (even itself) via gravity, so it doesn't clump like normal matter can. During and after the collision, it seems that dark matter just passed right on through, thus becoming separated from the normal matter. Note that the actual galaxies of the two clusters (which contain a small fraction of the total normal matter) are also visible as two clusters located at the same place as the inferred gravitating mass (blue). This is because, like the dark matter, galaxies are collisionless (stars are too sparse to collide). Here's another collision with similar results found in 2008. The colors indicate the same measurements as the Bullet Cluster (blue is where gravity is generated, red is where the normal matter is). Postscript to actually answer the question: We have found galaxies that are almost entirely dark matter (Dragonfly 44) and ones that have almost no dark matter (NGC-1052-DF2) However, it is unknown how these galaxies came to be like that or whether collisions were involved. As for the Bullet Cluster, I think you are right. In billions of years, there will be two galaxy clusters speeding away from each other with less luminous matter than expected and a gradually cooling mass of gas in-between. Not the answer you're looking for? Browse other questions tagged astrophysics collision dark-matter galaxies or ask your own question. What happen when two galaxies collide? What happens when astronomical bodies made up of Dark Matter collapse or collide? How much dark matter is needed to gravitationally distort light? Can you collide with dark matter? Is there a possibility of anti-dark matter? What happens when antimatter hits dark matter? 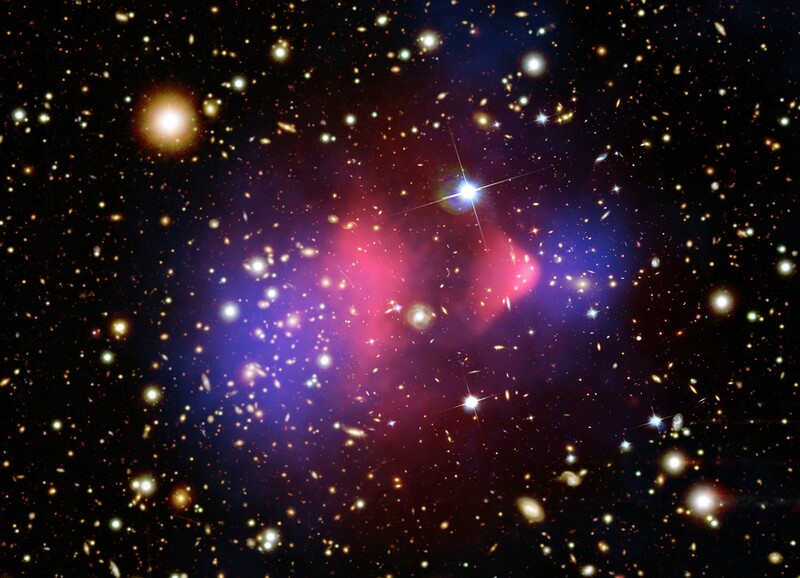 What is the percentage of dark matter in the galaxy? 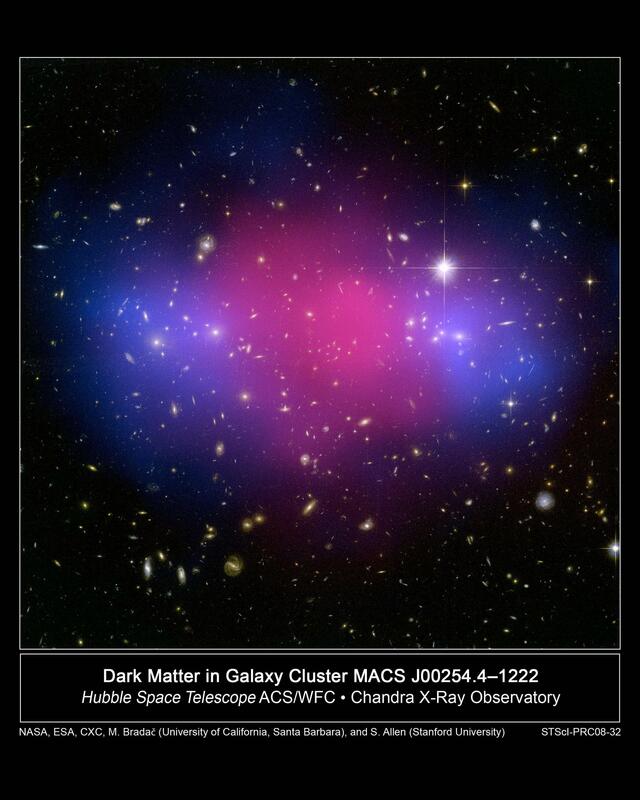 Is the dark matter present only around the galaxies?